John wouldn’t let me take his picture. Previous PostPrevious Being happy: New Tea! Hey there! I'm Mandy Bee, a knitwear designer on a mission to inspire knitters to embrace their geekiness and be completely themselves! 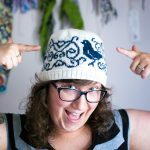 You can find my knitting patterns on Ravelry and me on Twitch.tv, where I stream knitting, crochet, and other fun & geeky crafts! Get Pattern Release Notifications, Knitting News, & More from Mandy Bee! You can easily unsubscribe from my newsletter at any point by clicking the unsubscribe links at the bottom of my emails to you!